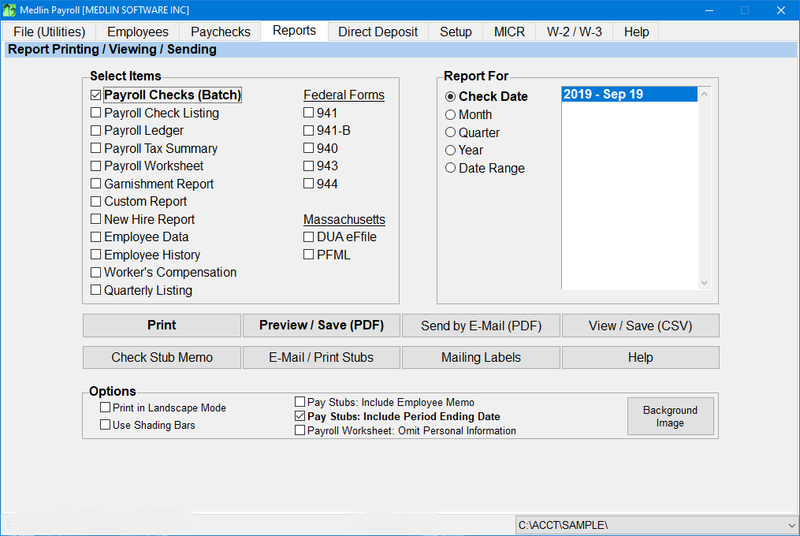 2019 Payroll Software by Medlin - No monthly or per employee fees! Payroll Software by Medlin is an easy to use and reasonably priced payroll software program. Simple and fast to use for the busy do-it-yourself business owner, yet full featured and easy to use for those who prepare payrolls for their clients. Perfect for any small or medium sized business, non-profit, church, or fraternal organization payroll processing and reporting. Click here for a special offer for new Medlin Payroll Software customers. Payroll Software by Medlin has no monthly or per employee fees! Payroll Software by Medlin is licensed (paid for) once per tax year. Download and install a FREE TRIAL in less than two minutes, even with a slow internet connection. To start the download and installation process, click here. Review our "getting started" instructions, then enter your data. All data entered while using the free trial of Payroll Software by Medlin is retained. Simplicity is the key! Pay your employees in minutes. Payroll Software by Medlin is compatible with current desktop versions of Windows. Payroll Software by Medlin has been featured in PC Magazine and PC World, is a Shareware Industry Association Award Winner, a ZD Net 'Editor's Pick', a Windows Users Group Network 'Pick of the Week', and is rated 'Best of the Internet' by PC Computing Magazine. Medlin Software was established in 1984 and continues to be a family run business. We offer fast customer support via email, online chat, and text messaging, with replies sent in minutes during our business hours. Our software documentation is available online, and by clicking any of the Help buttons in our software. 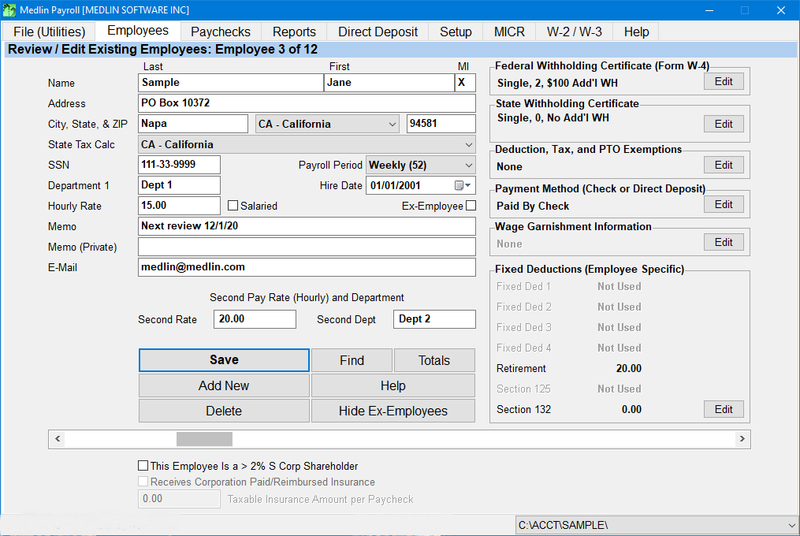 Features include: Complete payroll capabilities for most businesses preparing their own payroll. Create payroll records, payroll reports, and manage your payroll tax liabilities. Print checks and paystubs on pre-printed check forms. Create direct deposit information and email paystubs. Built in calculations for Social Security, Medicare, Federal Withholding, State Withholding, and more. Nearly any withholding requirement can be handled. Includes direct printing, on plain paper, of common Federal Tax Forms, W-2 and W-3 forms, and supports many state tax reporting requirements. Where required, creation of files for electronic reporting is available, including quarterly state reports. Easily handle required paid time off (sick leave). Medlin Software is installed and run on your computer. All data remains under your control. Starting payroll mid-year? Refugee from another payroll software provider? Not a problem! Click this link to see how easy it is to begin using Payroll Software by Medlin. Handwriting your checks, or using another check writing system? 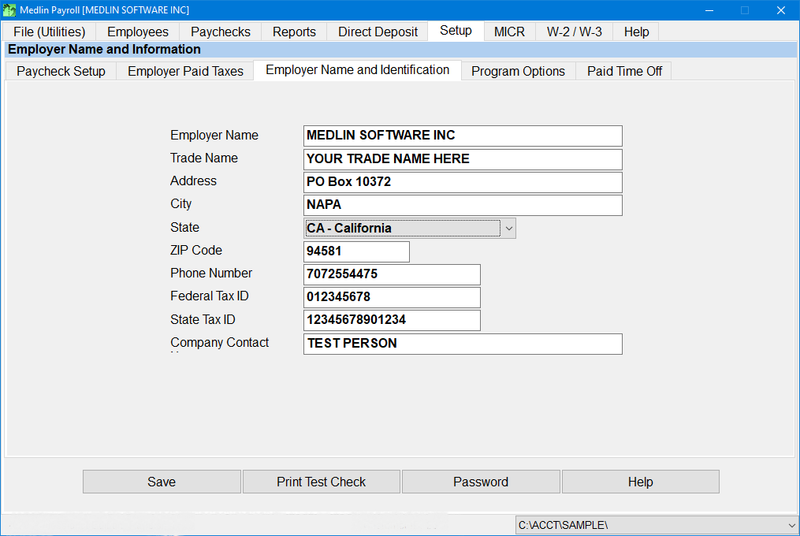 Payroll Software by Medlin can be used to print pay stubs on blank paper and/or email pay stubs to your employees. Payroll Software by Medlin is available in three editions. Click here to compare. Payroll Software by Medlin: Classic Edition The most popular edition of Payroll Software by Medlin. Quickly and easily prepare your own payroll. Pay your employees using using direct deposit, pre-printed check forms, or hand writing checks. 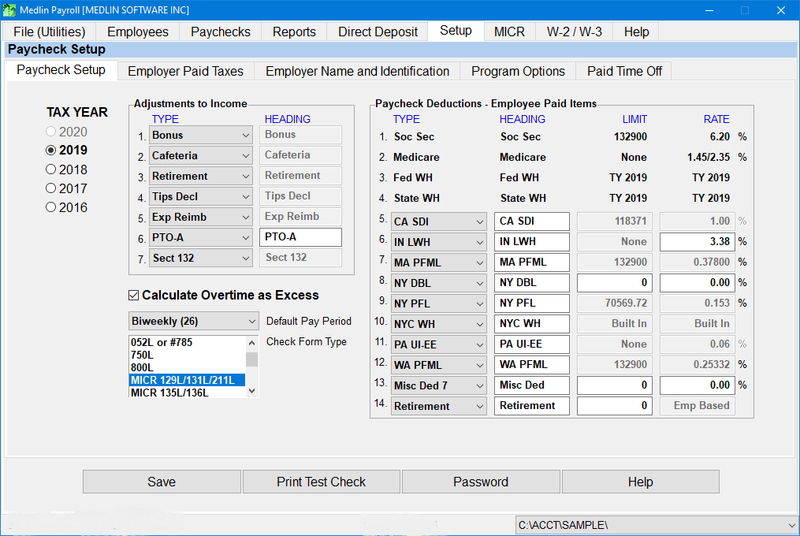 Payroll Software by Medlin: MICR Edition Contains all functions of our Classic Edition. Adds the ability to print paychecks on blank check paper instead of needing pre-printed check forms. 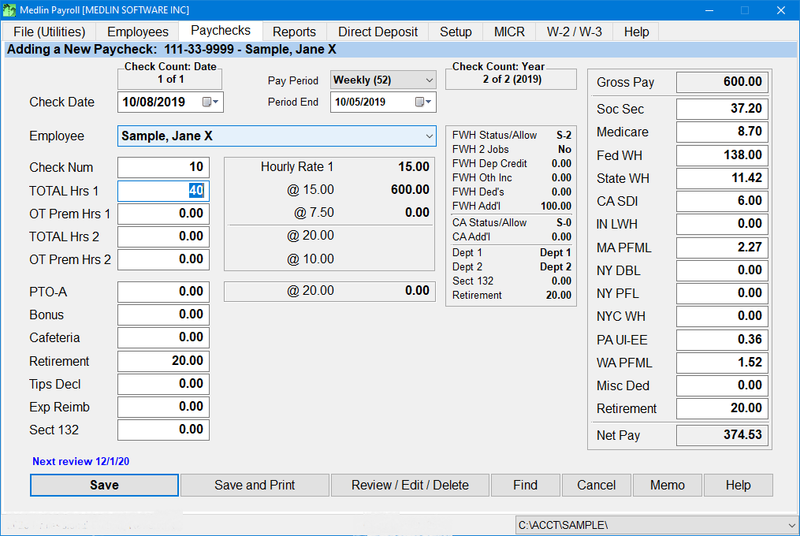 Payroll Software by Medlin: Professional Edition Contains all features of our Classic and MICR Editions, plus features specifically for the payroll professional or those with a more complicated payroll. California setup shown. Can be setup for any state. Payroll Software - Medlin Software, Inc.